Running has its challenges, especially for athletes who are looking to run really fast or for a really long time. But for many professionals, and fitness enthusiasts who are just looking to get in great shape, flat land can’t compete with the hills. Whether it is running up or down hill, the workout presents challenges that flat land cannot. Johnson has trained several NFL wide receivers including Terrell Owens, Chad Johnson, Antonio Brown, and Robert Woods. Johnson views running on hills as a way to build strength in the legs, which is why he has his athletes perform that type of training. 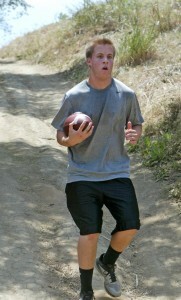 Johnson does not have his athletes simply run up the hill. He has them perform downhill training, which is great for anybody who competes on cross country courses. Uphill training works the concentrically, while downhill training works the muscle eccentrically. He also adds calisthenics to the mix by having the athletes perform plyometrics and lunges while going uphill and down. Research has shown that Johnson is on the right track when it comes to training. A study performed by Italian researchers found that when running at a seven percent incline for five minutes will increase the heart rate by 15 percent. Overall metabolic cost, which is measured in calories, increases by 53 percent. Running hills is similar to resistance training as the activity in the glutes is increased by 83 percent. “If you run hills consistently, it’s like doing a lot of squats,” Johnson said. For the weekend warrior, or for people who are just trying to get in good shape, running hills adds a degree of difficulty that Johnson said will get them to their goals at a faster rate. An elevated heart rate means that the intensity level of the workout is greater, burning more calories. And the added leg strength and endurance in those muscles will help anybody who is competing in athletic events, such as triathlons, or adult league basketball games. “If they took to the hill, their game will improve tremendously,” Johnson said. For a tougher workout, get off the flat ground and find some hills.